Beluga Dive Vavau offers the best prices for Dive Trips and Whale Swim trips with experienced instructors and boat operators. Beluga Dive Vavau has been owned and operated by the original owner for 20 years. Beluga Diving offer a variety of Diving Trips with experienced local guides. Beluga Diving offer a variety of Diving Courses with an experienced instructor. Booking: To enquire or book email us. 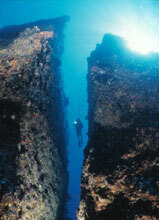 Our Dive Operation is located at Fangafoa Marina in the capital of Vava'u, called Neiafu. Tonga has a lot to offer the world with its beautiful Coral Reefs that stretch over fifty different dive spots and there is still a lot more to discover. The visibility is between 25 meters (82 feet) to 40 meters (131 feet) and the Water Temperature is between 24C degrees (74F) to 28C (84F). Our Dive operation has 2 boats, MV GLADIATOR, a 34-ft Catamaran aluminium boat with a cabin that has Twin 100 h/p 4 stroke Yamaha engines and this boat can take up to 12 divers comfortably and travels at 25 knots and MAD MAX: is our runabout boat and also our boat to take out Open Water students, this boat can take up to 8 divers comfortably and travels at 19 knots. We have Aquanaut and Sea Quest B.C.D. 's and Regs. with Octopus and SUUNTO dive computers. Our Dive Tanks are Aluminium; the sizes are 10 Litres (85-cubit ft) and 12 Litres (95-cubit ft).